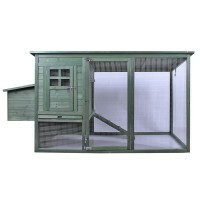 Material: Solid Wood Product dimensions (L x W x H): 130cm x 90cm x85cm Package dimensions (LWH): 125CM X 90 X 15Cm Package Weight: 22KG Features High quality fir wood construction with mesh wire Fully enclosed bedroom on upper level Spa..
Great easy clean hutch. 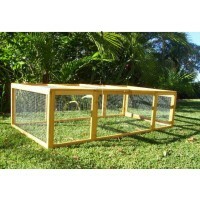 Red brown stained with green trim Fir timber chicken, rabbit, guinea pig cage. Door to sleeping area can be opened or closed with metal handle. Features: Asphalt roof Removable galvanised tray for easy c.. Features: Material: Natural fir wood Colour: Natural timber color with green top (naturally blend in with your backyard) Designed to last long for your beloved little ones Nesting box with lid Compact size is sui.. 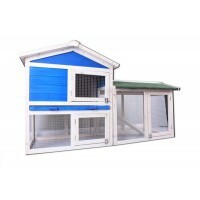 Single Storey Rabbit / Guinea Pig Hutch, Off the ground design, It come with two living area, a enclosed bedroom to promote privacy, and a open living area. Complete with a large access door in the bedroom and an asphalt roof, plastic tray for .. 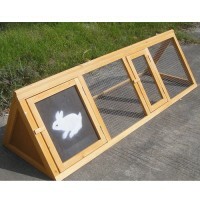 This rabbit run is constructed by high quality solid Fir wood. All timber are treated with waterproof agent. 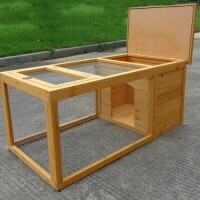 It can be used standalone, or attach to other Rabbit Kingdom Series Rabbit Hutch, or similar size brand rabbit hutch. Dimensions: .. 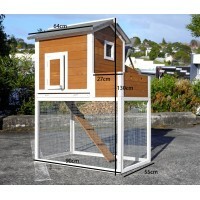 Features: High quality Fir Wood Construction with mesh wire Spacious, comfortable and safe for small animals 2 living areas, include sleeping area and integrated ground enclosure Fully enclosed sleeping area, which makes.. Features: The roof are cover by asphalt to provide maximum protection against heat and rain. 100% safe for small animals Galvanized wire mesh keeps your pet safe from snake and rat Able to be moved around the yard easily. .. Features: Product size: 2000 x 750 x 1030mm Green Asphalt roof for rain and sun heating Protection 3 living areas:Sleeping area, nesting area and integrated ground enclosure Fully enclosed sleeping area, which make your .. 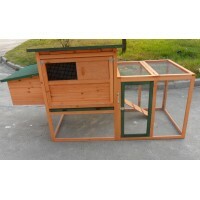 Features: This rabbit hutch is constructed by high quality solid Fir wood with heavy duty metal grating. All timber are treated with waterproof agent. Tough durable construction with high quality solid wood and mesh wire UV resistant ..